As anyone who’s followed the Cleveland Browns this offseason knows, there may be no name more popular than that of Jimmy Garoppolo. Many peg the New England Patriots backup as a perfect candidate to solve Cleveland’s everlasting quarterback search. If the Browns could swing a deal with New England to acquire Garoppolo, some pundits believe they would be as close to having a franchise QB as they’ve been in a long time. Of course, whether or not a trade is made comes down to the asking price. Trying to find out just what exactly the Pats are demanding has been tough, but the consensus seems to be they’re at the very least asking for a first-round pick. Though I initially deemed this as too high of a price tag for Cleveland, I’ve been able to make peace with the idea of trading the No.12 pick for Garoppolo. It’s certainly a risk, sure, but I could live with it. With no can’t-miss QBs available in the upcoming draft, why not take Myles Garrett first overall and use the next pick on a (mildly) more experienced solution? I wasn’t on board with it at first, but after some time, I was able to accept this as a legitimate price to pay. So how do I feel when I read the new reports claiming New England is now looking for a first-rounder this year and a first-rounder next year in any deal for Garoppolo? The Pats can’t be serious. They just can’t. Clearly this is an attempt to see how much they can con an unwitting team into paying up, no matter how ludicrous the asking price is. For the sake of addressing it, though, this much has to be said – the idea of Cleveland giving up two first-rounders for Garoppolo is so ridiculous it’s laughable. Just to refresh with everyone, New England is reportedly looking for more first-round picks than Garoppolo has complete NFL starts. Despite the fact the backup QB has only logged about six quarters worth of time as a starter, the Pats are trying to convince us he’s worth a first-rounder this year and next. I won’t waste time explaining why this logic alone is insane. Reading it aloud should do more than enough to help you understand that. Instead, let’s focus on how the Browns giving up that much for Garoppolo would be a potentially-high reward/extremely-and-outlandishly-high risk move to make. Fresh off a 1-15 season, it’s clear Cleveland requires an influx of talent something awful. In order to do that, the team needs as many assets to work with as possible, none more important than draft picks. Considering this alone, the idea of parting with two first-rounders, including what would be the Browns’ only first-round pick next year, for an unproven backup quarterback doesn’t make the slightest bit of sense. 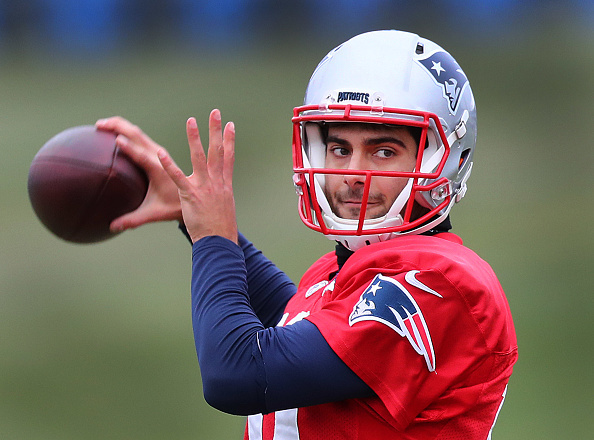 When you consider Garoppolo’s contract situation, it makes the idea even crazier. Remember, he’ll be heading into the final year of his current contract. It’s very difficult to believe he’ll agree to an extension as part of any potential trade, much less with a Browns team still searching for any semblance of success. So, Cleveland would have one season to convince Garoppolo it’s a team worth sticking around. Likewise, he would have one year to prove he could be the franchise quarterback the Browns have been looking for. I ask you, then, to imagine where the Browns would be if they can’t convince Garoppolo to re-up, or if he ends up being a bust with them. Then consider the fact Cleveland wouldn’t have a first-round pick to try and find his replacement. Even the Johnny Manziel saga didn’t set the franchise back as badly as this scenario would. The Browns are a bad team. They’re not one solid offseason away from being a contender. They aren’t even one away from being a decent team. As a result, the idea of them giving up multiple first-rounders for an unproven backup quarterback is pure insanity. Throw in the fact the pairing of Garoppolo and Cleveland might not even last longer than one season, it’s even worse. There’s still time for the Browns to talk this demand down. Some reporters claim this year’s No.12 pick and a fourth-rounder could get the job done, a price I’m far more comfortable with. However, there’s just no way Garoppolo is worth the Browns throwing away two first-rounders. I’d like to think the team is in the same boat as me on that thought.